As with Schumann's Concert Piece for four Horns Op. 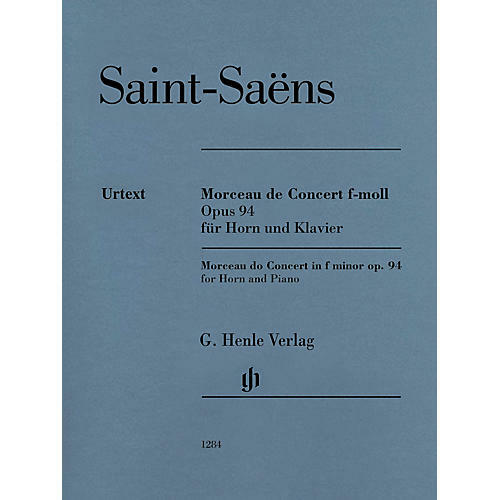 86 (HN 1138) Saint-Saëns' Morceau de Concert was also composed with the idea of exploiting the technical possibilities of the new valve-horn mechanism. In this case, the French horn player Henri Chaussier provided the impulse. He had developed a novel Cor omnitonique and wanted to demonstrate the merits of his instrument with Saint-Saëns' composition. Chaussier's invention did not gain acceptance amongst horn players - although the Morceau de Concert did! From today's standpoint the popular work with one movement is not overly demanding technically; in addition, Saint-Saëns himself suggested two abridgements to simplify the piece, meaning that even advanced pupils can venture to play it.